I write with the idea that teachers will read my scholarship. That includes peer reviewed articles, invited pieces, and this blog. So, when I write, I am always talking to teachers who are the influencers on what gets read in the classroom. Now, don’t get me wrong there are others who read my scholarship — librarians, parents, other scholars — and that’s great but I’m in teacher education for a reason. They (who are THEY anyway?) say numbers don’t lie – but I’d say they only tell part of the story. The numbers on the teacher representation are undeniable …. it is a White world in teacher education. The latest statistics show a little over 80% of teachers are White, and 77% are women (Taie and Goldring, 2018) and that isn’t likely to change anytime soon. At the same time, 51% of students are non-White and that number is increasing in every state. Here is what we also know, teacher expectation is a huge predictor of student outcomes, and White teachers expect less of Black and Latinx students (Boser, Wilhelm, and Hanna 2014). What can we do? Each of us must think about how we can change education to best serve all students. For me that means I spend a lot of time developing ways to help teachers shift their ideas about literature in the classroom. One area I spend a LOT of time thinking and writing about is graphic novels – novel length narratives (both non-fiction and fiction) created in comics form. I think of graphic novels as the grandchild of comic strips, and the child of comic books. It is important to think about the form and the history of the form. Comics, at least here in the United States of America, have a long history of being by and for White, straight men. But, the readership has changed in the last 25 years. Although the leading comic book publishers (DC and Marvel) don’t want to face the fact that the readership has grown beyond White, straight guys, that is exactly what has happened. But, publishing is a conservative business, so changing it is like steering a cruise ship in an ocean of Jello. It is slow to change direction and takes a hell of a lot of work. I recently saw a tweet from National Council of Teachers of English (NCTE) that featured this image …. I was excited at first and then disappointed. This is the kind of emotional roller coaster I am all too familiar with and it goes something like this …. Hey! Look! Graphic novels in my Twitter feed! Wow – from NCTE. Big dealio! Getting some traction here! That’s a really White list of books. That’s a really male list of books. Ugh … now everyone is re-tweeting. Let me explain. I have been keeping a database of graphic novels published for k-12 readers. It started with a focus on books with protagonists that were women and girls, but it has grown. It is this huge pile of data that I wade into every once in a while and muck around in. I have added all sort of items – such as the race and gender of authors and illustrations; the total number of identifiable characters by gender, race, and if they speak. I’m trying to develop a way to measure the quality of representations (this is still a work in progress). It’s a lot … and I’m not sure what the data is showing me yet. It is a really, really, really low bar. Sometimes that is what we are dealing with – the lowest of low bars and I think we really need to be doing better than this. I mean, think about the ABSOLUTE minimum you are willing to provide for your students, and then look at this list another way. Corinne Duyvis came up with the idea of #OwnVoices in 2015. She suggested the hashtag “to recommend kidlit about diverse characters written by authors from that same diverse group.” The idea that marginalized people are better equipped to tell those stories has become much more contentious then I think anyone expected. But, when we see lists like this, it is important to look at who the authors and illustrators are, who’s voices are being heard, and who’s are not. I waded into my database and pulled the titles Matt listed as “series” and “single story” graphic novels and created some charts. Take a look at who is writing the graphic novels that Matt uses in his classroom. Out of the 33 creators – some books had an author and illustrator(s) – 27 are White, one Black* and three Asians. No Latinx, Indigenous, or Middle Eastern. men. This monochromatic selection is not a reflection of what is available in graphic novels. It is a reflection of what this teacher chose for his students. The protagonists in these graphic novel series that Matt selected for his class and recommended for your classes, the results were just as disappointing. The vast majority of the characters were either White or NOT HUMAN. That’s right, you have a better chance of seeing yourself reflected in these books if you are a talking rabbit or a Yeti, rather than Latinx, Black, Asian, Indigenous/Native American, or Middle Eastern person. Additionally, looking at these protagonists I found they were overwhelmingly male. There were no gender non-conforming characters, and no LGBTQ protagonists to be had across these series. The “single story” graphic novels on the list were a bit different when it came to gender. Here there are more female protagonists. There were still no no gender non-conforming characters, and the 2 LGBTQ characters (both male) were written by a straight woman. There were no non-humans in these books. But, the clear majority of these protagonists are, once again, overwhelmingly White. The 3 Latinx protagonists were from the same, hugely problematic graphic novel – Ghosts. You can read about the issues here on my blog, and here on Dr. Debbie Reese’s blog. Matt, the teacher who posted the list, is trying to provide interesting, engaging, and complex literature for his students. He is trying to open space for his students. But, he forgot that all literature, including graphic novels, are not culturally neutral. Students need to read a wide range of authentic representations of genders, sexual orientations, abilities, races, and ethnicities. That needs to be non-negotiable because our students deserve no less. * Thank you for the careful read Mary Reilley Clark, @SEMSLibraryLady, and the catch. I mistakenly wrote that there were 3 Black authors, there is only 1. Taie, S., and Goldring, R. (2018). Characteristics of Public Elementary and Secondary School Teachers in the United States: Results From the 2015–16 National Teacher and Principal Survey First Look (NCES 2017-072rev). U.S. Department of Education. Washington, DC: National Center for Education Statistics. Retrieved July 2018 from http://nces.ed.gov/pubsearch/pubsinfo.ap?pubid=2017072rev. I must confess, I have a special place in my heart for big stats. Not for the reasons most researchers will give – I don’t think the TRUTH lies within big numbers. No. But, I think massive amounts of data can give us two dimension of a story – sort of the breadth and width of things. And, in this case, the THING I am looking at today are picturebooks. To be precise – I’m looking at Great #OwnVoices Picturebooks. The Cooperative Children’s Book Center is the children’s literature go to organization for Big Data. Publishers both big and small send books to the CBCC all year and the librarians (both staff and students) count all the things. The annual collection consists of “books typically available for sale to public schools and public libraries”. As you can see, with a few exceptions (2004-05, 2013) there has been a steady increase in the number of children’s books published in the United States of America. Too many publishers, scholars, authors, editors, librarians, and teachers have told us – People of Color, Native Americans, the LGBTQ community, people with disabilities, and non-neurotypical people – to wait our turn. We’ve been told that change takes times, and above all else, to give authors, editors, and publishers the benefit of the doubt. It stands to reason, if we wait for the market to grown, then the pie gets bigger, and the bigger the pie, the more share I get. Right? Right!?! RIGHT!?!?!?!? Well, the results from the CCBC 2017 count is in and it is a freakin’ crime (thanks to Lee and Low for putting tother this infographic). I want to draw people attention to this bit, down here, near the bottom of the image …. you see that? Seven. Siete. Sept. S-E-V-E-N. As in the 7 Deadly Sins kind of seven. I’m not giving up and I know my colleagues are committed to educating literary gatekeepers to recognize the need for a rich variety of diverse #OwnVoices literature in classrooms and libraries. In addition, the authors aren’t stopping anytime soon. Providing children and young adults with a wide array of authentic representation is a change that will make us a better society – full stop. Unfortunately, White writers and editors are freakin out about SEVEN PERCEPT! of children’s books that are published being by and about under represented communities. They are clutching pearls, and asking to see all the managers, because they are threatened by the very idea that we are demanding a wide array of representation written by the people being represented. Please see Nora Baskin’s Ted X talk for the best of this not-isolated-at-all-flaming-trash-heap of White fragility in action. Instead of leaving you with this dismal state of affairs, I want to highlight some #OwnVoices picturebooks that you need for your library and classroom. In addition, I am going to URGE you to go to Goodreads and Amazon to post reviews! This picturebook just made me feel good about being Latina. Alma is a little girl with a big name – Alma Sofia Esperanza José Pura Candela. This book is a beautiful and loving illustration of the ways Latinx names recognize and honor our histories. The illustrations by Martinez-Neal are striking in their quiet grace. Using what looks like pencil and charcoal Martinez-Neal brings a vibrancy to the lives of Alma’s ancestors, as well as to the ways she identifies and connects with them. When We Were Alone by David Robertson and Julie Flett. I used this book with my children’s literature classes because of the complex and subtle narrative structure. This book gave me, a non-indigenous person, a small glimpse of the fallout from the cultural genocide boarding schools perpetrated on Native Americans and First Nations people. (And yes, it was genocide. Calling it anything else and you are just trying to make yourself feel better). The book features a young girl hanging out with her Kókom (grandmother) and asking her why does things like grow flowers, wear a long braid, and laugh with her brother. The reasons are all bound to her Kókom’s time in boarding school. Throughout the picturebook there are tensions: the simple premise and the hard subject matter; the plain faces and the expressiveness of those faces; the colorful beauty of the little girl and her Kókom alongside the drab and faded look to the boarding school images. Flett’s illustrations could be used as a master class in mood – a notoriously difficult literary concept to teach across k-12 English Language Arts classrooms. The changes in color palette from the present to the past signals the changes in time, place, and mood to the reader. Phi’s intimate story of an early morning fishing trip with his father is told in sparse text and rich colors. The gentle ways the story unfolds keeps many readers engaged and enthralled. The deep melancholy of the book makes it stand out among children’s book. A tired young boy and his father getting up before day break to fish is familiar story. What makes A Different Pond unique is that it takes a common story and tells it from an immigrant’s point of view. The boy references his father’s accent (Vietnamese) “A kid at my school said my dad’s English sounds like a thick, dirty river.” The father tells the baitman, who he obviously knows well, that he’s got a second job. What surprises many readers is that this family is fishing not for sport, or fun but for sustenance. They talk about how difficult immigrating to the United States has been and why it is worth it for their family. And, by taking the young Bao Phi with him, this father is including him in his love and care for the family. The year has begun. We will have a new president in two weeks. The Southern Poverty Law Center is gathering data that shows an initial increase in hate crimes and hate speech, followed by a slow down. Twitter is … well … Twitter but more so these days. I still haven’t figured out Instagram or Tumblr. They make me feel old. And so, 6 days into 2017 and people are wondering what can be done to make things better, more civil and less frightening. Well, I am all about DOING. So, I have a small project I think you can help with. I might be biased, but I think we should be doing more reading. Reading outside ourselves. Reading good, authentic representations of people, places, and histories that have NOTHING to do with us or our lived lives. And so thanks to a bunch of people who contributed (link if you want to add to the list) I have a pretty good start on a list of books written by authors that come from marginalized communities. These marginalized authors are writing books – good books and great books – that are not getting enough attention. I want readers to amplify the voices of these authors who are members of marginalized communities because books are being written by actual marginalized people with great characters, authentic settings, and solid story telling. How can I help? What can you do? As a member of Reading America you can do two things. Get the book from the library. If they are not in your libraries holdings, ask for them. Or purchase the books, direct from the publisher or a local bookseller. B) After reading, write a review and add your voice to amplify these authors. You can help create buzz and excitement around their works. You can change the direction of publishing (maybe) and prove that White, straight, able America can read and enjoy literature that does not center White, straight, able America. Give it a shot. Upload your review up on Goodreads or Amazon or both. But, how can I write a review? I’ve never done that? It makes me nervous and I avoid things that make me nervous. Don’t panic Reading America! I’ve got a book review starter kit here for you. You can copy and paste this (fill in the blanks) and then BA-BAM! Review written! I read — BOOK TITLE — by — AUTHOR — and absolutely loved it. << Write something specific that you loved about the book: Characters, Voice, Plot line, Setting work here>> This is the first book by this author that I have read, and I am glad I stepped out of my usual comfort zone! I highly recommend this book for — NAME SOME SORT OF HUMAN BEING WHO MIGHT ALSO LIKE THE BOOK — and plan on reading — TITLE — next! Here is what I wrote for March, Book 1, on Goodreads using this template. I read March, Book 1 by John Lewis, Andrew Aydin and Nate Powell and absolutely loved it. I was completely blown away by the powerful black and white illustrations and the intricate ways the text and illustrations work together. This is the book first in this series that I have read, and I am glad I stepped out of my usual comfort zone! I highly recommend this book for anyone who wants to know more about the beginnings of the civil rights movement in America and plan on reading March, Book 2 next! Thats it. Read, write a little, post it and read some more. I’m catching up on my reading list and I finally got around to opening up Andi Watson’s Princess Decomposia and Count Spatula. it’s a fun black and white graphic novel with just a hint of romance. Watson is a comics author that is trying his hand at a long form graphic novel and he’s pulled off a brilliant balance between simple lines and illustrations and a charming story. The book begins in the Underworld with Princess Decomposia dealing with her bedridden father (the king), his crazy neediness, all the kingdom’s business dealings, the responsibility of finding a new chef. She is crazy busy, trying to keep all the balls in the air, and stressed beyond her limits. What I appreciate about Princess Decomposia (Dee to her friends) is that she is the quintessential caretaker to the entire underworld. As she walks from one end of the castle to the other she receives state papers, long letters, and updates about the political goings on. In addition, she spends her days negotiating with foreign dignitaries trying to balance her fathers wishes, the good of the kingdom, and peace. On top of her more than stressful duties she must hire a new chef. She finally settles on one, Count Spatula. His first action, before even getting the job, was to take care of the princess which is something no one else in the castle thinks to do. She has been running around all day, hasn’t eaten and feels lightheaded. He not only rushes to her side, he also pulls tea and muffins from his chefs hat and gets the job. But more importantly, he begins a friendship with the princess. The illustrations are lighthearted and simple but that is not to say they are simplistic. Instead, Watson takes care to use very few lines to communicate emotion and humor. Although the counts face is not much more than a heart shape with a few lines, he is able to convey a full range of emotions. The other characters are less simply drawn but no less expressive. Count Spatula is a good guy, even for a vampire, who loves sweets and has a flair for the dramatic. At one point he concocts a set of dessert that rains delicious lemon curd into the guests. His meals are a success, maybe too much of a success for the kind to be happy. The king is taking an extended, hypochondriac-induced vacation from his royal duties but he is more than happy to direct the court from his bed. And Dee (princess Decomposia) is stuck trying to be both a ruler and a servant to her father. Eventually, with the thoughful council of Count Spatula she begins to delegate and gain some control over her life and her sanity. But, that isn’t what the king wants … he wants to have his cake, and eat it too. The king decides the count has to go and so he sends her away for a day in the above world. When Dee decides to take the count with her, it leads to a terrible confrontation between the king (who not sick but is rather lazy and selfish) and the princess. 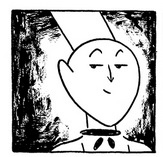 In the end, Dee is in charge of the kingdom and Count Spatula is in charge of the kitchen, but more importantly they are in charge of supporting and loving each other. This is a great story for emergent readers, readers are are just beginning to read graphic novels, and romantics alike. I just returned from a great Literacy Research Association (LRA) conference held on Marco Island, FL. Like many in my field I have few colleagues in my sub-sub-sub field (graphic novel reading) and LRA gives me a change to catch up on everything. It leaves me exhausted and invigorated. So, I came into the office – it is something like 19 degrees outside and 87 degrees inside – ready to grade papers, talk to students, and change my syllabus for next semester’s children’s and YA literature course to reflect the research I saw at LRA. But, before all that started, I found the latest in George O’Connor’s Olympians series in my mailbox!!! Like so many graphic novel readers I have loved this series since Zeus (Vol. 1) but truth be told Hades (Vol. 4) was by far my favorite and remains so today. Ares: Bringer of War is another solid edition to the series. The color red runs throughout the book, beginning with the cover. In this book O’Connor does some interesting work delineating Ares and Athena early on. Athena (Vol. 2) is given a cool shade of blue-gray as her color and it reflects her appreciation for strategy as a way to enter into war with a clear and levelheaded strategy. She is not swayed by passion or emotion, or so she would have us believe. Ares on the other hand is the epitome of passion and madness of battle. The image of Ares and his sister Eris plunging into war provide a beautifully disturbing starting point for the story. The blue gray calm of the bottom left portion of the page is ravaged by Ares and Eris’s flaming chariot as it rips through the troops. The soldiers fear and confusion is apparent as their wide, white eyes that stand in shocked contrast to the rest of the page. Ares: Bringer of War highlights the connections between the Olympian gods and the Trojan War. First as a comparison between Athena and Ares, then as a stage for the continued competition between Hara, Aphrodite and Athena (see Aphrodite: Goddess of Love). After all, it was the competition between these three which began the Trojan war in the first place! And so it is with this volume that O’Connor provides us with another view of the gods and the whimsy they took with human life. The treatment O’Connor gives to Hara, Aphrodite and Athena is oneof the most interesting aspects of this book. Each one takes a champion in the war to represent their godly interests with no regard for the mortal himself. O’Connor provides a visual of the ways champions were mere puppets for the gods: Athena looming like a large shadow over Diomedes as she takes him into battle against Ares, and Hara feeding words of encouragement to her army through Stentor as she stands behind him. Ares, like many of the gods of Olympus, lost a son in the battle for Troy, but unlike the other gods he truly grieves the loss. His grief becomes the catalyst for a short lived brawl between the gods, but the war rages on between the mortals well after the gods have lost interest. The lively images and playful treatment of some of the gods makes it a fun and exciting read. But as a retelling of the Iliad it lacks the coherence I have come to expect from O’Connor. Because he dips in and out of the traditional story, this volume might be confusing for readers who don’t know the Iliad, or the divisions between the the Greeks and the Trojans. Given the shortcomings of the text, I think this volume would be a great supplement Homer’s Iliad. The battle of troy rages on even after the gods loose interest, except for Zeus and Ares. They remain to the bitter end. Ares understands his own nature, and in the end he realizes he is much like Zeus, his father. And this realization brings no relief to Ares or, as it turns out, to man. Here is Part 2 in a 2 part series. I wrote it all at once but I have gotten some great feedback, so I’m adding a bit to this second part. Again, I feel like I need to make things as clear as possible. I write and think and teach children’s literature, and a big part of that wok is looking for, evaluating, and talking about literature by and about underrepresented people in America. I am a member of several of these underrepresented groups, but I am not now, nor have I ever been, Native American. Now that we have that as clear as I can make it, here goes the second part of my 2 part series on Native Americans in graphic novels. Into the Woods by J. Torres , illustrated by Faith Erin Hicks. 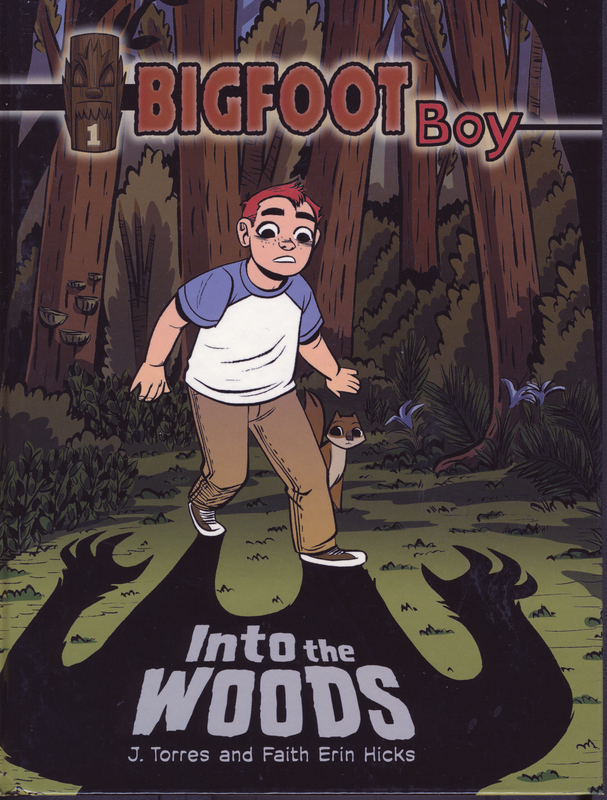 This is the first of the Bigfoot Boy series by KidsCan Press. I received this book, along with the second book in the series (The Unkindness of Ravens) and read through both books with high expectations. Finding what are termed “all reader” graphic novels is a challenge and I think of KidsCan as a very good publisher with some very smart and funny books. After all, these are the people who brought us Scaredy Squirrel (a series I love). The Bigfoot Boy series is about a city kid, Rufus, who goes and visits his grandma for a weekend. She lives on the edge of a forest where Rufus has a big adventure. He finds a “totem”, a small carved figure with the word Sasquatch etched into the back, that turns him into Bigfoot Boy. He gains the ability to speak to and be understood by the animals of the forest and lots of other cool things. He quickly becomes an enemy of the local wolf pack and gains a smart alack squirrel as a side-kick. All of that seems fair game, if a tad far fetched. Unfortunately, while reading the book a number of issues came up, specifically around the supporting characters in the book. Rufus’s grandma’s neighbors (do you need a diagram for that?) are a couple of cute Native American girls, Aurora and Penny. 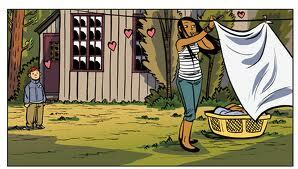 Rufus is immediately attracted to the older sister, Aurora, as illustrated by the floating hearts emanating from him as he watches her hang laundry. Penny is less friendly, but that might be because she is so busy being one with nature. Her sister refers to Penny as a “skunk” because she a) has a shock of white hair interspersed with her jet black, straight hair and b) is someone who is hard to get to know but is friendlier than they appear. As a matter of fact, Penny’s “animal spirit guide” is a skunk! Aurora explains all this to a fascinated Rufus. The issue I have with Bigfoot Boy is not that Native Americans can’t be part of other people’s stories. As a matter of fact I love stories where people’s ethnicity are shown to be a part of them and thier lives but that is not the center piece of the story. The issue I have with Bigfoot Boy is the use of Native Americans as supporting characters and the subtle and confirming stereotypes the book possesses. I’ll illustrate a few of them. The first issue I saw with the novel was the fact that Aurora and Penny’s tribal affiliation is non-existent. When Native Americans are treated as if there is no difference among them it is another way of negating their culture. HERE IS THE BIT I ADDED — For me this is an obvious mistake that shows an egregious lack of understanding. I consider it in the same way I do when people throw the word “hispanic” around, or assume all Latinos are Mexicans (this happens a lot in California), or think that all Latinos are basically the same. Mexicans are not the same as Colombians, or Puerto Ricans – just look at our tamales to see the differences! Next, Aurora is first seen as an object of Rufus’s desire. I understand that young boys are sexual beings and have sexual feelings (I also understand that young girls do, too). My issue is that Aurora’s first appearance in the book is in the roll of some kind of Indian Domestic Goddess. HERE IS THE BIT I ADDED – Again, this view of women and girls simply being a place holder or a vessel for male desire! Aside from her dark skin and black hair Aurora has almost no features. She is a flat character that acts as a) road sign for Rufus and Penny, and b) a sexual object. Might as well post a centerfold on a sign post. Penny, adhering to a long tradition of vaguely American Indian characters in literature, is first seen being “one with nature”. This is a problem that comes up repeatedly with the way American Indians are represented in literature and in children’s literature in particular. HERE IS THE BIT I ADDED – Native Americans can be one with nature but it is the prevalence of this single attribute that bothers me. It is as if there is a genetic marker that makes Native Americans commune with nature and it goes without question. Instead, why didn’t the author provide a bit more information about Penny? Why does she spend so much time in the forest? Also, why does she go around calling it her forest if she’s all about the Native American ideal? 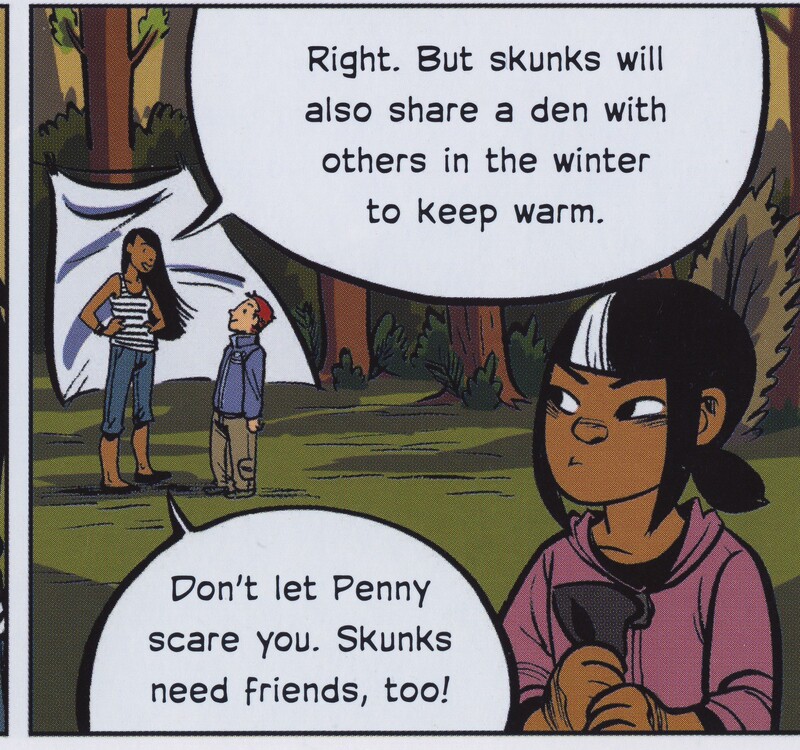 Most bothersome to me is that although Penny is constantly being “one with nature” it is Rufus, the White kid from the city, who discovers the mystic totem and becomes the forests protector. Some might accuse me of reading too much into this but all I can say is REALLY??? The great White male is going to be the savior? Again? Why can’t Penny, guided by her stinky, off-putting animal spirit guide find the totem that turns her into Bigfoot Girl, and back again? Some of the issues I have with the book might be what is termed benign stereotypes, like “all Asians are good in math”, “Jews are good with money”, or “gays are so fashionable”. The problem with these kinds of stereotypes is that they do not allow for individuals to be anything more than the one dimensional caricature created by the dominant culture. So, yes, taken one at a time, these issues might not be so bad, but the preponderance takes this graphic novel out of the “fun filled” category and places it squarely into the “should be avoided” zone. It’s Monday … What are you reading? “It’s Monday! What are you Reading? is a meme hosted by Sheila at Book Journeys. It is a great way to recap what you read and/or reviewed the previous week and to plan out your reading and reviews for the upcoming week. It’s also a great chance to see what others are reading right now…you just might discover the next “must-read” book! I’m going to give this a shot. I read a lot of graphic novels but I also read everything from picturebooks to YA novels. This will give me a chance to talk, in brief, about those books as well. I have long been a huge fan of Scaredy Squirrel. He is a total hypochondriac, pretty OCD, and generally anxious to a degree that makes me feel pretty good about myself. This Halloween edition is a mix of surprisingly helpful advice on things like carving pumpkins, and silly stuff like “The apple: A Scary Fruit”. I’m usually not a big fan of themed books, but this one is pretty funny. I have been searching for lesbian stories in YA novels for a while now. There are simply not enough out there so anytime I find one, I read it. I have been disappointed more times than not at the quality of writing, the flat characters, or the general sense of disgust at yet another doomed romance. It feels like no one wants lesbians to be happy. So, it was with great trepidation that I started If You Could be Mine. It is all of those things I just complained about – a doomed lesbian teen romance. But, it is so much more. The characters are alive and breathing. The setting, modern Iran, reads less like a ravel log and more like the authors back yard that she is letting us see for awhile. And, although the romance is doomed, the characters are, amazingly, not. I’ll be blogging about this one soon. Let me just say … AWESOME!!! Full of silliness, honor, dodgeball, and gnarly big toes that must be kept safe. Enough said …. One of the issues teachers face when trying to integrate graphic novels into the classroom is a lack of general knowledge about the medium. Some interesting research shows that teachers want to use these books but do not know enough about how to read comics in general or how to evaluate graphic novels in particular (see Thomas DeVere Wolsey’s blog). Although I started this blog with SUMO, I must admit it is not a great book for novice graphic novel readers. 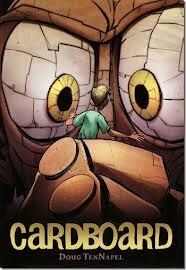 On the other hand, Cardboard by Doug TenNapel is a great graphic novel to start your exploration of the media. 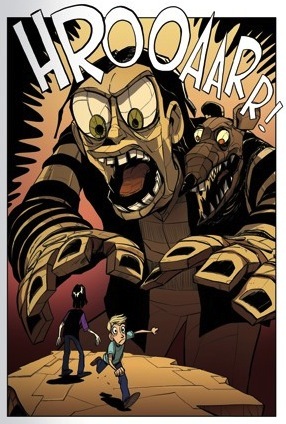 TenNapel is the author of other works such as Ghostopolis and Power Up (you might see a resemblance between Mike, the father in Cardboard and Hugh the protagonist in Power Up). 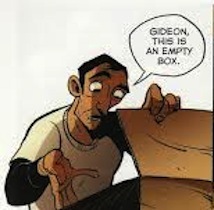 What makes Cardboard a great graphic novel for novice readers is something I call alignment. The words and images in graphic novels should support each other and push each other to make a greater whole than either one or the other is capable of on it’s own. When images and words are closely aligned, they support each other without pushing too many boundaries. When the alignment is irregular, disturbed, or even completely disconnected (in works such as V for Vendetta by Alan Moore and David Lloydor, or American Born Chinese by Gene Luen Yang) the works are more complex and difficult to read and understand. For some books,the complexity of story, words, and images makes for genius, but that may not be where you want to start. One metaphor I have been playing with for understanding how words and pictures work together is that of constructing a house. You can think of the words as the framing of the room. What shape does it take? Are there lots of windows or just a few? Are the ceilings vaulted? The words provide the structure for the story. Then there are the images, which make up the walls, floors, paint, carpet and furniture that give you a sense of what the room should be used for and for whom it was constructed. You can have the frame or the finishes, but you need both to have a room. Cardboard uses a rich but straightforward palette of warm tans and browns that provide a kind of comfort, even when people and cardboard monsters are at war – but I’m getting ahead of myself and the story. Mike is a construction worker who is out of work. He’s also a father, a very bad cook, and a widow. He has no job, no wife, no support of any kind but he does have a great kid, Cameron. The novel begins on Cam’s birthday with Mike realizing he doesn’t have a dollar to his name for a present. He ends up buying a big cardboard box from roadside toy stand for 79 cents (yeah, people in stories actually stop at those stands). Turns out the big cardboard box is full of magic or alien technology or space voodoo and one thing leads to another – including the creation of a cardboard-come-to-life boxer named Bill, Cam’s arch nemesis, Marcus, stealing the technology to make more magic/alien/voodoo cardboard which of course leads to an evil cardboard King Marcus attempting to take over the world, or at least the neighborhood. The story is fast paced with Good and Evil clearly demarcated with a sprinkling of personal redemption. Best of all everything, literally, works together to solve the problems that come alone (and alive) int eh story. The coherent narrative is a pleasurable experience with just enough creep-factor to keep it from edging into a moralistic contrivance. TenNapel’s drawings are closely aligned with the words giving the reader a good story. The people looks like people, the rats look like rats, but when they combine, they look awesome! TenNapel’s use of a connected color palette full of tans and browns, along with his consistent use of regular paneling that only breaks in times of high stress. There are brilliant/gross touches throughout- such as when Marcus’s best friend Pink Eye defends himself by giving a one eyed cardboard monster an instantaneous and massively nasty case of conjunctivitis. There is references to body functions (including cardboard blood, a beating cardboard heart, and cardboard spit). All of this combines for a solid story where the images and the words support each other.